want app adoption? focus on the gays. Most mobile developers and entrepreneurs are looking to figure out a way to on-board “normals”, but if they really want to have their app adopted (and potentially make money) focus on the gay community. Just make sure your servers are ready for the onslaught. 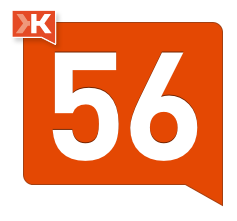 As far as services go, Klout is incredibly confusing. Somehow the team created a business (?) out of determining ones influence in obscure ways on the internet. I log in for fun now and then, exclaim to my colleagues (who kindly humor/ignore me) the random things Klout finds me influential in. Continuing to peruse my profile, I wonder about how the metrics are determined, marvel at the fluctuating score analysis graphs, and then go back on my merry way doing typical Leslie things. Occasionally though, I do log into find amazing insights like this. Most of the time though, what Klout has to share with me is not relevant. Basically because I have no idea what it all means. However, being the naturally curious individual that I am, I downloaded Klout for iPhone when it premiered. Why? No clue. Curiosity drives us in strange ways, I’ve found. But I digress. From what I can see, the iPhone app adds no value to whatever it is that Klout is offering me in the first place. I can look at my profile from the app, but there is no there there, if you know what I mean. The app monitors when my score goes up and down and sends me notifications when a change occurs. 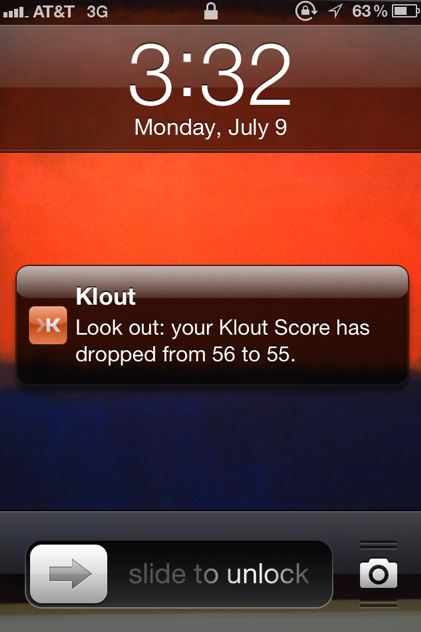 Aside from the obvious solution of turning off Klout notifications, what action is one supposed to take at this alert? Perhaps something funny like this? Since my Klout score is meaningless to me, I have no desire to do anything, but I still don’t understand why the app is necessary. I don’t use Klout Perks, but even if I did you can’t access them from the app. You can’t give Klout to other people from the app. You can look at other people’s Klout profiles, but very limitedly. I just don’t get its point. Interestingly enough, Klout thinks I am influential about Klout. Maybe that will increase after this post, which would amuse me. And continue to baffle me. Good times! 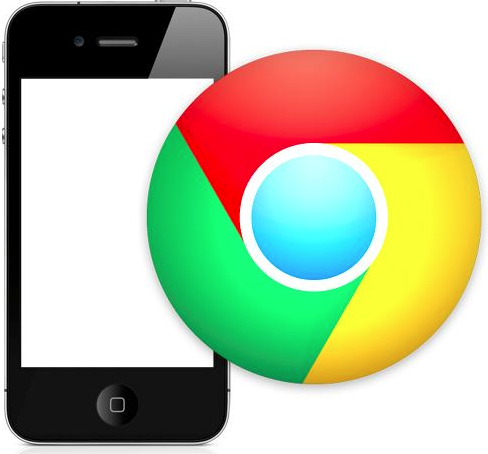 Consider this app designated for the land of the app graveyard. Last week I backed up my iPhone and for whatever reason, iTunes decided to reinstall every app that I had ever downloaded and previously deleted from my device. It was quite the blast from the past, seeing all of my discarded interests reappear — jarring and slightly sad. I’d had such high hopes for some of them, some didn’t suit my style, and some seemed to require more effort than I cared to put forth. It was almost like sifting through memories of old relationships, if I get slightly theatrical about it. Perhaps you are different, but I regularly trim the overgrowth of apps on my phone. In what I’m sure isn’t a coincidence, lately a few of the folks I follow on Twitter have been talking about paring down the number of apps they maintain on their devices. As I respect these people greatly and have been doing the same, I began to consider my own current consumption and pruning habits. What makes me decide to move on from an app so decisively that I delete it entirely? A few things come to mind. 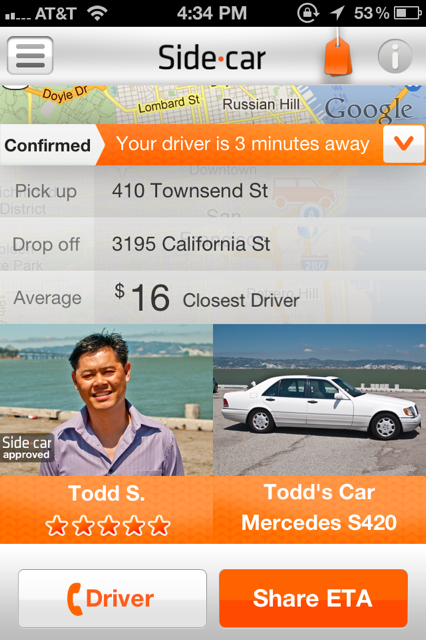 Relevancy is key and must be one of the main things that keeps mobile app entrepreneurs up at night. 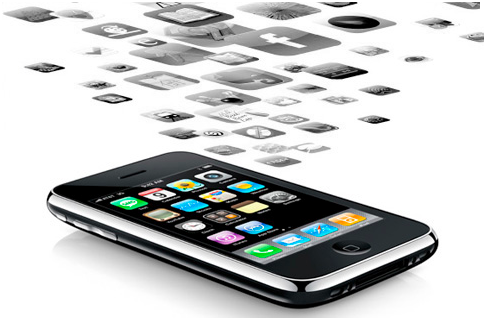 If your app isn’t relevant then it has no traction. Unfortunately nothing stays relevant all the time. At one point I downloaded media apps with gusto: CNN, NPR, NBC News, SF Weekly to name a few. I was going to read the news, dammit. But then they sat idle, taking up valuable space on my device. And it occurred to me that I get all of the news I’m interested in from Twitter! Why keep these specific apps when one will do? The choice was clear: delete. The big guys like the news outlet apps above give me no gut wrenching sensation when I cut them out. 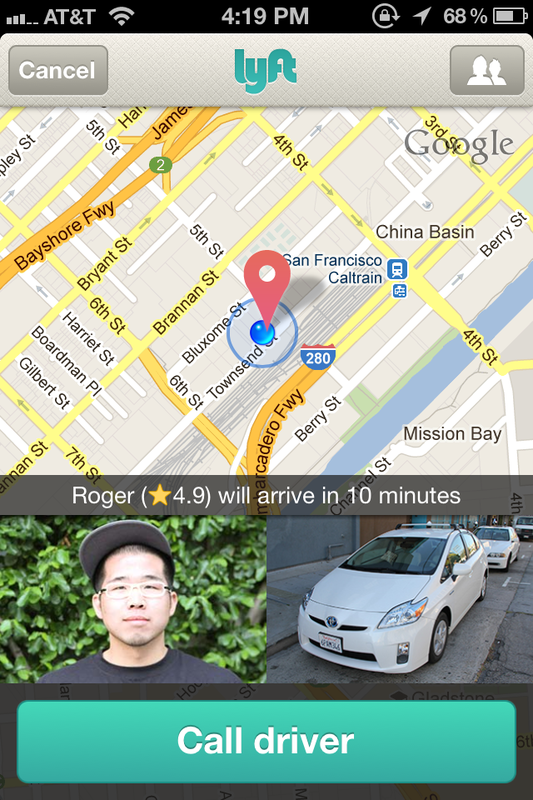 The mobile app startups do. I hem and haw because I feel an affinity for those setting out and doing something new, even more so when I respect the hell out of their investors. In some cases I know the entrepreneur behind the product, so it becomes more personal. However, if the app isn’t relevant for me anymore I can make the choice to do what’s best for me and my iPhone memory. A subset of relevancy. True in life, this applies to mobile consumption too. Things just change; sometimes for what initially appears to be no good reason. “Oooooh! I really LOVE the Nike+ running app!” becomes something different in no time if it starts to affect my mental health. As in life where relationships falter, where yoga doesn’t seem as appealing anymore, where I’m suddenly over a restaurant I enjoyed yesterday, etc., etc., ad infinitum, a question like “Do I absolutely need this clunky DeYoung Museum app all the time?” periodically surfaces. Sometimes I’m ready to let go when that directional shift occurs, sometimes I hang on. But the question does eventually come and preferences change. Sometimes it just feels good to delete stuff. How many people have I talked to who after completing a major Twitter or Facebook friend overhaul say “It felt so good!” The last grooming of my apps included not just deleting but also sorting my most used into folders and finally putting it all on my home screen. It has been a few weeks and periodically I forget where I’ve filed an app but when I went through that exercise I felt like I was accomplishing something. If I can’t recall the last time I launched a particular app, then it swiftly gets the axe when I’m in this mode. I am a Type A, do-er after all. Since I’m a curious person, I thought I’d ask: how do you decide when to delete an app off your phone? Do you delete them at all? Are you as philosophical about it as I am (…apparently)? Tell me, tell me! Fanfare! Buzz! Fred Wilson! Download now! That’s what the Brewster app launch looked like today. Did I take the bait? Of course. Should you? Absolutely. 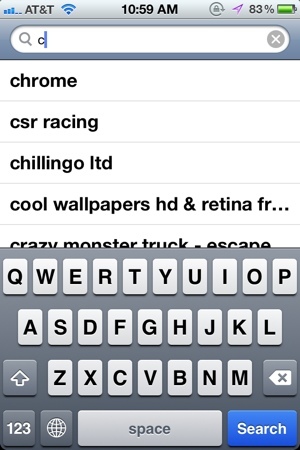 Brewster‘s aim, to disrupt your iPhone’s native address book, is deceptively underwhelming. To the basic mobile user, the address book is taken for granted as the way we maintain our contacts. But with Mercury entering retrograde on July 14 (yes, I went there) having all of my contacts backed up in a (non-iCloud) cloud is perfectly timed. What Brewster does though is so much more and it is beautifully executed to boot. In fact, the way Brewster is designed and behaves reminds me of Path. And we all know how I feel about that app. 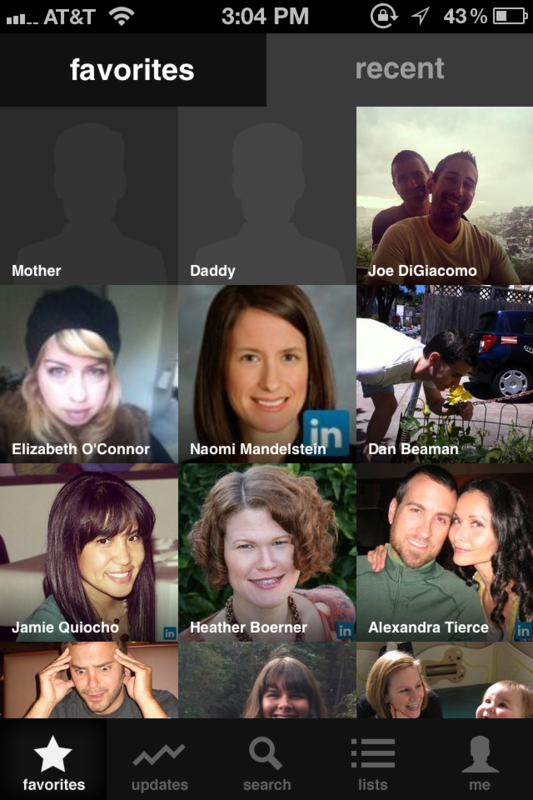 When the app initially launches, it takes you through all of the various ways you can be connected to someone. 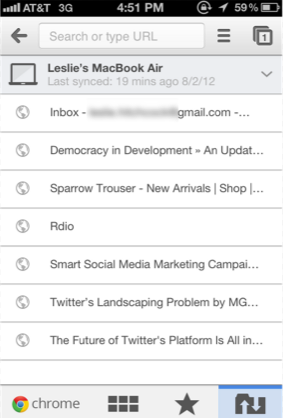 I synched my Twitter, Facebook, LinkedIn, Gmail and Foursquare accounts in addition to my actual address book. After Brewster collects the data from those various sources it notifies you that you’re ready to begin. The first step is selecting your favorite people, the ones you communicate with most regularly across the sundry networks. That sounds more boring than it actually is. Check out what it looks like. So pretty. 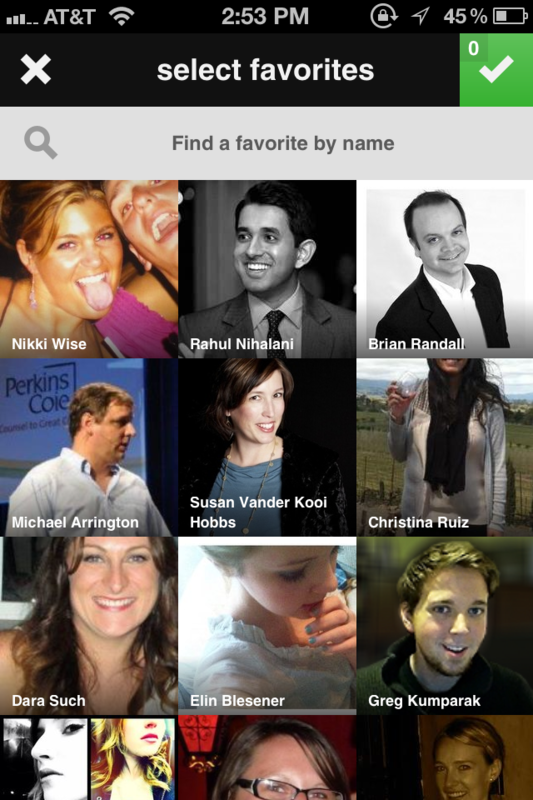 After checking off your favorites they are easily ordered and then accessed by how recently you interact with them. What was frustrating about this process is when you’re connected with one person across multiple platforms. For example, my mother showed up as Mother (what I call her in my address book; I am Southern after all) and under her actual name due to her Twitter account. Perhaps I just haven’t uncovered this feature yet, but it would be great if Brewster could condense all entries for a single person into one entry. UPDATE: A “merge” feature exists within contacts! Man, that Brewster team thought of everything. But in all fairness it is slightly buried. I’d prefer it if that feature was automated and made suggestions of contacts to merge. Once you get your favorites situated, write a blog post, publish screenshots of who your favorites are and potentially offend everyone else you’re close to, there are more ways to interact with Brewster, all of which are designed to make staying in touch more simple. 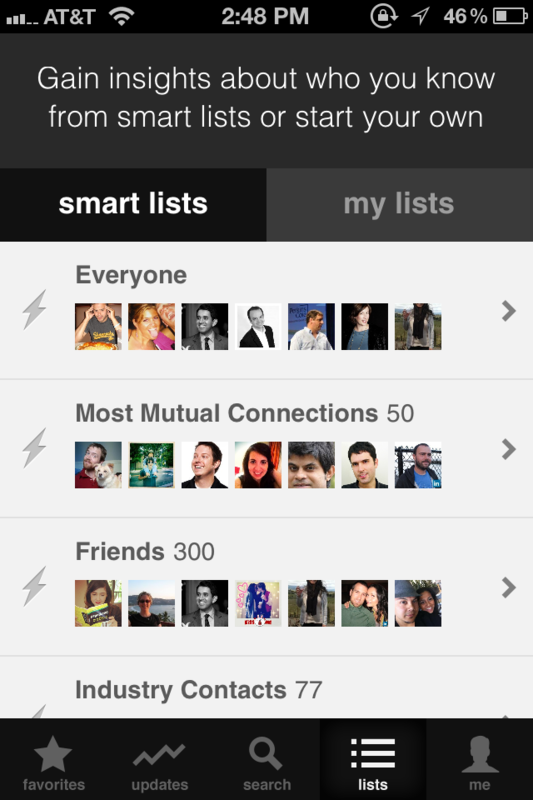 Lists, network updates, search capabilities. You name it. The Brewster team covered all of their bases with regard to functionalities. I’ve made calls from the app, texted and emailed. It is a seamless experience and because of the ease of transition to those functions, feels native. Actually, it feels better than native because it isn’t so blah to look at. I’ve said it before and I’ll say it again, aesthetics are important. Once a text or an email is sent, you’re directed back to Brewster, but that isn’t the case with the phone functionality. It leaves you stranded high and dry in the phone app. Not sure why that is different. The lists feature is pretty neat. I like how Brewster suggests lists based on my interests: San Francisco contacts, TechCrunch people, industry peeps, etc. Most Mutual Connections is pretty fun in the tech industry. But with over 1,000 contacts based on all of my networks, the key function I’ll use the most (aside from my favorites) is the Search feature. I’d comb through them all and delete extraneous people to make it more manageable, but with favorites that seems unnecessary. Plus, who knows when I’ll need to get a hold of someone who today seems random. Updates is the only feature I’m not quite sure about but that is simply because at this point it hasn’t populated for me. Apparently at some point it will alert me to who’s around, industry notables, who is “trending” in my world and who I’m “losing touch with”. I’ll be curious to see what my reaction is at that point. Urgency or apathy or something in between? More will be revealed! Until then, I think I’m sold on this app. 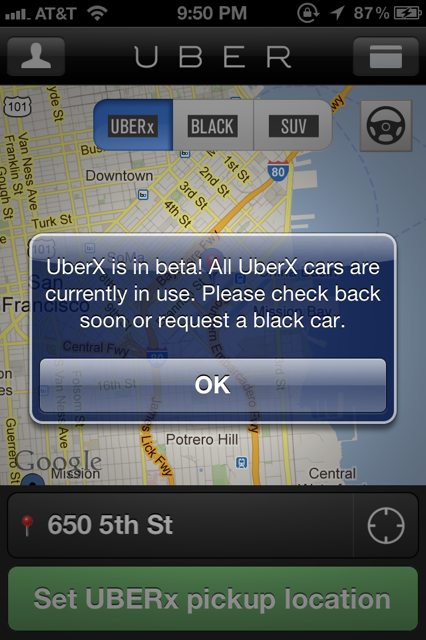 More native iPhone app disruption, please! If you have had any type of dealings with me, you know I have a problem. A problem I complain about loudly and often. And from what I have come to believe, the first step is admitting it. So here it goes. Hi, my name is Leslie and I am incapable of maintaining battery power in my iPhone. Enter Carat. Clearly, I suffer from terminal uniqueness if I believe I’m alone in my iPhone battery woes. Carat’s premise is simple, if not simplistic: fire up the app to learn various ways to conserve your battery life. 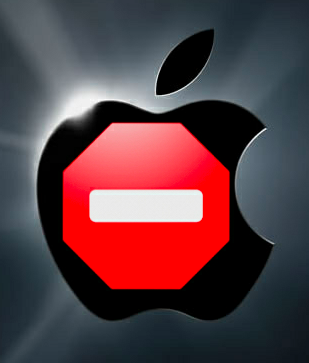 I say simplistic because once Apple’s iOS allowed apps to run in the background even the most novice of iPhone owners know to shut down the apps they’re not currently using. 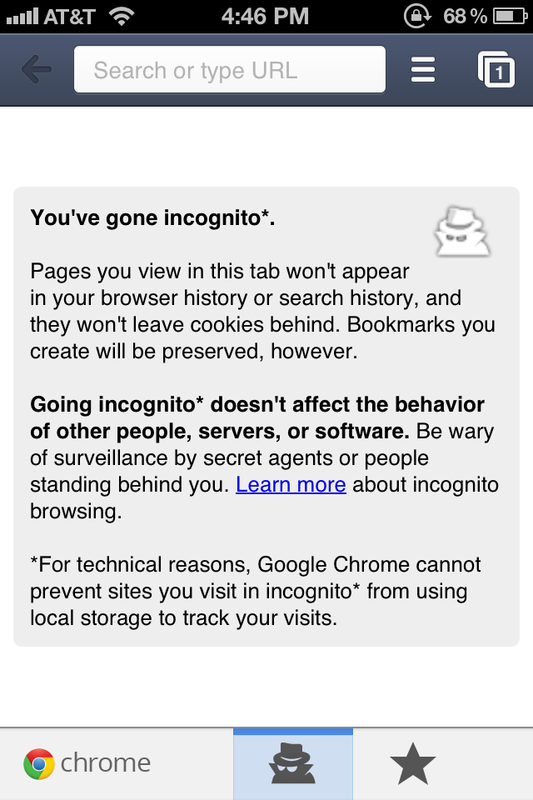 Because I fall into the camp of compulsively checking to make sure nothing is running in the background, I was curious to see if it could help a more advanced user base. My findings are mixed. At first, Carat suggested that I could save about two hours of battery life if I updated my software to the latest version. This freaked me out because I’m obsessive about staying up to date. I connected my device to iTunes only to learn that I was on the latest version already. This left me doubtful on Carat. However, my next time playing with the app bolstered my confidence. How did I never think about killing the SMS app when it wasn’t in use? Apparently that thing takes a lot of power because I can save almost 30 minutes of my 6 hours of battery life by shutting it down. The app allows you to tweet from it, but the actual tweet is really confusing. It just references a J score with no context and a link. This did make me curious about what a J score is, though — wouldn’t you want to know too? Basically, it stacks your iPhone’s battery life against all the ones it measures through the app. Mine is barely above average with a paltry 57, meaning my phone scores higher than 57% of Carat users. I’m undecided on if this makes me proud or sad. Just for fun, I decided to open all the apps I usually run in a given day to see what the worst offenders are. Surprisingly, none of them registered on the suggested kill list, but I did see a large shift in the active memory I was using. This makes me wonder if my shutting down of apps I’m not using is worth it or if Carat is measuring something else for their suggested improvements. Regardless, I’ll stick with my best practices and enjoy watching my J score decrease as my battered iPhone 4 limps its way to oblivion and an iPhone 5 purchase. And kudos to the team that built this! It will be fascinating to see what you come up with next.